Mount Kilimanjaro is the tallest peak in Africa and at a height of 5895 m, it is also the tallest free standing mountain in the world. After climbing the mountain, I can say that if you are thinking of climbing the tallest in each continent, Africa would not be a bad place to start. 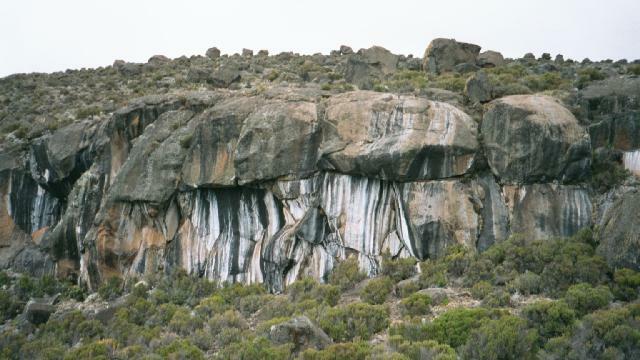 There are many paths up the mountain and the Marangu route, the one I took, is the easiest and due to this reason, is also known as the Coca-Cola route. The climb is gentle and only at the very end would you be required to use all four limbs. There are tougher routes - whisky route, rum route etc. available to the professionals. The climb (via the Coca-Cola route) starts at the Marangu gate which is at an elevation of about 1800m. A good 3 hr walk through thick rain forests would bring you to the lower camp - Mandara, which is situated at an elevation of 2727m. A 15 min short hike from the hut would take you to a crater called Maundi, from where you can get very good views of the Horombo village and the surrounding tropical forests. 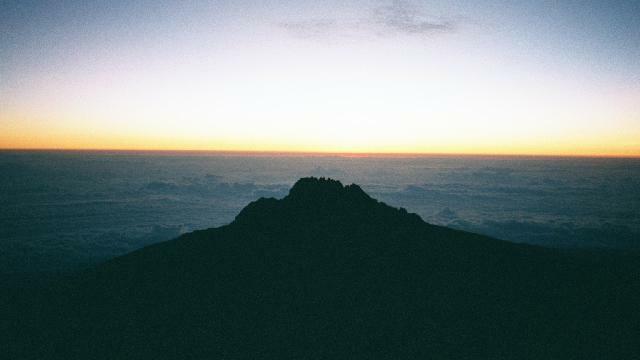 On the second day, you climb for 5 to 6 hours to reach the middle hut - Horombo. The hut is situated at an elevation of 3720m and during the hike to this hut was the first time I encountered altitude sickness. And it wasn't very pleasant, but more about that later. After about an hour from the Mandara hut, the thick rain forest gives way to shrubs and the views just get better and better. It is here where the Mt. Kilimanjaro presents its first view to the climbers. From Horombo one can get a real good view of both Mt. Kilimanjaro and Mt. Mawenzie, that is when they are not under a thick cloud cover. The third day, for some, would be spent in acclimatising to the altitude. Since this was the first time I am reaching these heights, I thought it wouldn't be a bad idea to spend an extra day up the mountain. How helpful the extra day is in reaching the summit, I know not, but there are many who believe that it is a waste of time and money. During the day, we took a short 3 hr hike up to 4300m. On the return leg of this hike, I realised for the first time, how easy it was to travel downhill. If only we could climb a mountain downhill... The hike takes up to a vantage point in-between the two mountains and apart from the two wonderful peaks, all that I remember of the hike is spotting a rather peculiar collection of rocks called the zebra rock, named mainly due to the alternate black and white stripes found on them. The task on the fourth day is a 5 to 6 hour hike from Horombo hut to the top hut - Kibo hut. Apart from the initial and final stretch, the bulk of the hike is on near flat land. But the altitude makes up for the lack of steep climb. 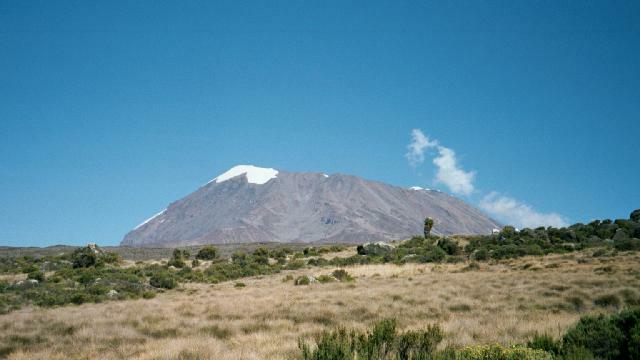 Kibo is situated at the foothills of the Kilimanjaro peak and is at an elevation of 4703m. Kibo also marks the point where visitors start saying the dreaded word "enough". Needless to say, the place was very cold and did not have any heating. As if these weren't enough, we had a snowfall that evening, which in hindsight, wasn't that bad a thing to happen. One it warmed up the place a bit, as a snowfall anywhere would. Secondly, it also helped in binding the rocks on the path, making it a bit less slippery. We had an early dinner this evening and slept early - not that the dinner times on the other days were much later, but having dinner at 530 would count as early in most people's dictionary. The reason we had to sleep early on the fourth evening was because our final ascent on the fifth day started at midnight. There are three reasons why we started so early for our summit climb. The most important of them all was the fact that the peak normally gets completely covered by thick fog by 8 in the morning. So it is imperative that you come back by that time to Kibo hut and as the summit is about 5 hrs away, you are forced to start at midnight to beat the fog. The second reason was to make it to the top when the view is the prettiest, viz., the sunrise and the final reason was to avoid travelling during broad daylight when you can get a good view of the steep path lying ahead of you. The importance of the third reason became evident when I looked back at the path after returning to Kibo hut. I certainly wouldn't have agreed to move an inch if I had seen the path before. I passed the 5000m mark, William's point, at about 2 in the morning and somehow crawled to the top by quarter to 6, in time for the spectacular sunrise. By top, here, I mean Gillman's Point which is at an elevation of 5685m. The actual highest point, the Uhuru peak is 210m higher and more importantly a good 2 hr walk from Gillman's Point. The effect of altitude combined with the knowledge that I would anyway get a certificate even if I reached only Gillman's Point, prevented me from going any further. 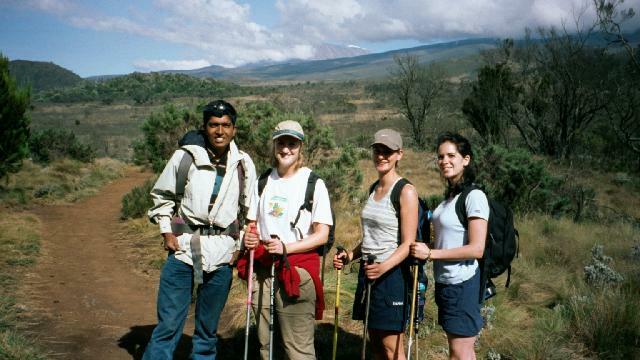 A Kilimanjaro travelogue would normally end with the person scaling the peak. But mine has to carry on till I reached the Marangu gate. Instead of spending the fifth night at Horombo, thanks to my tight schedule, I was forced to descend all the way to Mandara hut. I reached the bottom hut at 4 in the evening of the fifth day, and since my day had started at midnight, I ended up having a 16 hour morning walk with a small breaks at Kibo and Horombo. Breakfast in Kibo, lunch in Horombo and dinner in Mandara and that too after climbing up and down a brute of a mountain - it wasn't easy. My only solace was the knowledge that I wasn't alone in attempting the madness. My partner in crime was an Essex gentleman, one Mr. Garth Freeman and (I quote him here) : "After this, all that I am left with is a story to tell my grandchildren: your grand dad walked up the tallest mountain in Africa one day, and walked straight back home." I would not have reached the top if not for my guide, Steven Mtui, egging me on in the last 30 minutes of the climb and I am eternally grateful to him for showing me the best sunrise of my life. In helping me climb the mountain, no less part was played by my three wonderful Canadian climb mates - Leanne, Cheryl and Holly. As if climbing and staying with 3 lovely young ladies is not a motivation by itself to climb the hill, I was also able to reap the benefit of their profession: they were all nurses. Their wonder drug would always cure the strongest of my headaches. Without them, I wouldn't have gone anywhere near the peak, especially when I couldn't eat properly after 3500m, think properly after 4300 and breathe properly after 5000. Will I ever want to return to Kilimanjaro? Not until they find a water route. Coca cola is too strong for me! I am happy that I made it within 200m to the top of highest peak in Africa - after knowing what happened to Ngorongoro, I think I should say : highest peak in Africa as of the 2000th year after the birth of Jesus of Nazareth. Click here for more photos from Mt. Kilimanjaro.